Trophy Hunters Alberta has twice won the highly coveted Alberta Professional Outfitters Society award for the 'Largest Whitetail - Archery' on an outfitted hunt (out of 450 outfitters). THA owns 167 whitetail deer allocations, allowing THA clients to hunt whitetail deer throughout extensive areas of southern, south-western and west-central Alberta. Hunt Alberta in our extensive world class whitetail deer hunting zones covering over 15,000 square miles. Tim Wells, TV Host of Outdoor Traditions harvested this monster whitetail with his bow.Tim would return many times and has harvested several Pope & Young whitetail deer over the years. Visit Trophy Hunters Alberta whitetail deer photo gallery to view pictures of our guests' successful whitetail deer hunts. We can provide a whitetail hunt in the mountains, the foothills, the prairies and everything in between. We hunt bush, woodlots, open country, river bottoms, coulees, draws, grain fields, etc. 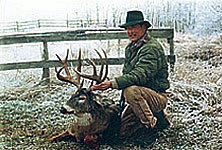 A few years back, a new world record archery whitetail deer (#2 B&C) was harvested in Alberta by resident Wayne Zaft. This whitetail deer grossed 222 B&C and netted 208 6/8. We offer a range of accommodations from working ranches to B&Bs, guide's homes, cabins, motels and full service lodges in the breathtaking mountain, foothills and prairie regions east of the Canadian Rocky Mountains. 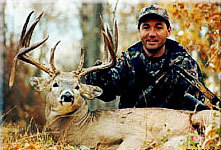 THA provides both archery and rifle hunts for Alberta's massive whitetail deer. Our guides are tested, proven and capable, with all of our archery hunts being guided by experienced bow hunters. THA's Archery Whitetail Deer hunts take place on the eastern slopes of the Canadian Rocky Mountains (WMUs 318, 320, 322, 324, 326, 330, & 429) and in the prairie (WMUs 104, 106, 110, 132, & 134) regions of southern and SW Alberta, including the famous Calgary Bow Zone (WMU 212). THA's Rifle Whitetail Deer hunts take place in several of Alberta's top producing whitetail areas including the prairie (WMUs 104, 106, 110, 132, & 134) areas along the Montana border and the foothills (WMUs 318, 320, 322, 324, & 326) and mountain (WMU 429) regions along the eastern slopes of the Canadian Rocky Mountains in SW and west-central Alberta. Alberta has developed the well deserved reputation of being the premier destination of choice for hunters looking for a quality whitetail hunt, and THA is well known for our ongoing success with whitetail deer hunts. On average, hunters should expect to see 130+ class whitetail during their hunt. Many hunters report seeing in excess of 30 whitetail during their hunt and, depending on the location and style of hunt, usually see several 'keepers'. We want you to get that 'big one' as much as you do, and often many of our hunters are fortunate enough to harvest serious whitetails. At THA, we do not oversell or embellish our hunts. At the end of the day, we do get the job done. Tim Wells, TV host of Outdoor Traditions, harvested a 195 class beauty on yet another hunt with THA. Several years ago, we harvested a 205 5/8 point non-typical archery whitetail in the Calgary Bow Zone. During one season 4 THA hunters in a 4-man camp at one of our working ranches in SW Alberta harvested a 187, a 178, a 160 and a 5x5 to go with their 3 excellent mule deer (two over 170 class). We are proud of our ongoing success with our whitetail hunting guests. Years of experience, combined with many excellent Wildlife Management Units (WMUs) allow us to customize each hunt to the specific requirements of our individual hunters to maximize the odds for favorable results. We include wolf & coyote hunting in all of our whitetail deer hunters. The odds of seeing a wolf are low in most areas, however, we usually harvest a few wolves each hunting season. Alberta coyotes are plentiful and generally larger than typically seen elsewhere. All our Whitetail Deer hunts are fully guided with 2 hunters per guide and are all-inclusive (airport service, guiding, accommodation, meals, rough caping & transportation during the hunt). There are no hidden, or surprise, charges and no trophy fees. One-on-one guiding is available on most hunts at an additional cost of $1,500/week. Also, non-hunters are welcome at an additional $1,500/week per person. All hunt pricing is in US funds and tax (5%) and licenses are extra. To book your Whitetail Deer hunt with Alberta's most respected big game outfitter, please phone us toll-free @ (877) HUNT-YES <(877) 486-8937>. We are also booking future year hunts at current prices. We also provide big game hunts for Mule Deer, Moose, and Elk as well as numerous combination hunts. Please let us know if you would like more information on these other species hunts. Whitetail Deer hunts are our specialty! We are now booking hunts for this fall and future seasons at current pricing. Prices for our hunts are very competitive, and are shown on our Website. For complete availability, dates, prices and booking information, please click Bookings.